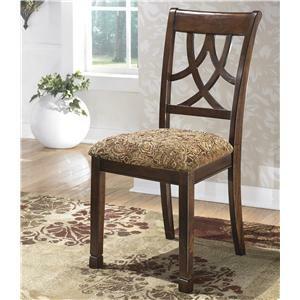 This simple traditional side chair will work well with your dining room decor. This versatile chair can be mixed with classic or contemporary pieces. 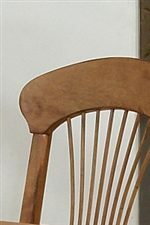 The stylishly fanned back slats give this chair character. Cream colored fabric upholstery on the seat make this chair comfortable, and easy to blend with your decor. The 1855 Dining Side Chair With Fabric Upholstered Seat by Primo International at Corner Furniture in the Bronx, Yonkers, Mount Vernon, White Plains, Manhattan, NYC, New York area. Product availability may vary. Contact us for the most current availability on this product. The 1855 collection will give your formal dining room a simple traditional style. The substantial light oak pieces will brighten your room and allow you to create an inviting atmosphere. 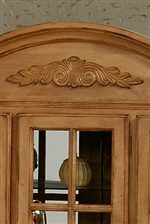 Details light a large double pedestal table with decorative turned legs, and a carved crown at the top of the china cabinet make this collection special. Antique metal hardware is a nice finishing touch. The 1855 collection is a great option if you are looking for Traditional furniture in the Bronx, Yonkers, Mount Vernon, White Plains, Manhattan, NYC, New York area. Browse other items in the 1855 collection from Corner Furniture in the Bronx, Yonkers, Mount Vernon, White Plains, Manhattan, NYC, New York area.